Good Oral Health - Nature or Nuture? Back then I didn’t overthink what she said. I was only eleven, and all I wanted to hear after going to the dentist was, “No cavities.” And that’s all I ever heard until I was in mid-twenties when I had my first cavity. Now I’m over sixty, and I don’t think I’ve had more than four cavities in total; no root canals or any other horror I always imagined could happen to my teeth. My grandfather was the same, although he probably didn’t have quite the same imagination. On the other hand, my sister has had more cavities than I can count. That got me to wondering if we can inherit bad teeth from our families. My sister and I are different in coloring, bone structure and a lot of other things. So it might not be so far fetched to believe some genetic marker gave her problematic teeth and spared me. To answer my own question, I did a little research on what elements of oral health are heredity and which are due to how I care for my teeth. It’s a different type of nature versus nurture. Along with specific physical characteristics like hair and eye color, the shape of your teeth and the structure of your jaw are hereditary. These two facial structures can create teeth that are overcrowded or misshaped. Without orthodontic correction, it can be hard to reach some surfaces of your teeth with your toothbrush. So while you may take great care of your teeth, you may have the potential for more cavities. Enamel covers the crown, which is the part of the tooth above the gum. Its purpose is to protect your teeth from decay. Genetics play a role in its thickness and strength. If the enamel is thin, your teeth will be more prone to cavities and other oral health problems. It may be difficult to believe, but genetics play a part in your tastebuds. You may love bananas, but your mother may think they taste like cough syrup. Genetics can determine that. A difference like that may not cross your path too much, but when people say they have a sweet tooth, it may have a basis in genetics. Individuals who gravitate toward sugary foods will increase their chances of developing cavities. Many factors contribute to the development of oral cancer, but evidence suggests genetics can play a role. But can you blame all your oral health on your genes? No. Even with these factors, you may not want to send your parents your dental bills just yet. Also if your teeth have been influenced by genetics, good oral health care can minimize any developing risk. 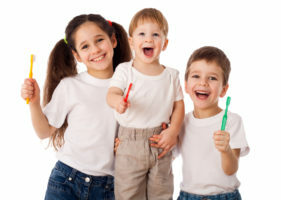 According to the American Dental Association, “Many common diseases are not inherited as a single gene defect but instead result from gene-environment interactions.” More simply stated, your dental hygiene, your environment, your habits and other factors can also help or hurt your oral health. In addition to genetic factors, the environment also contributes to your oral health. Attrition – When you clench or grind your teeth, which is often involuntary during sleep, this causes enamel erosion making your teeth more susceptible to tooth decay. Abrasion – When you brush your teeth too hard, don’t floss correctly or bite your fingernails, pens or other hard surfaces, you can wear away your enamel, increasing your risk of decay. Abfraction – Flexing or bending a tooth can result in stress fractions, which are slight cracks in your teeth. Bacteria can enter these cracks and brushing, or flossing can reach inside. Corrosion – This condition occurs when acidic food or liquid hits the tooth’s surface. Certain medications, vitamins, and food are highly acidic and can wear down tooth enamel. Frequent vomiting from bulimia and even alcoholism can also contribute to corrosion. If you are concerned about enamel erosion, watch for the following symptoms. Sensitivity – In the early stages of enamel decay, some foods, especially sweets, and extreme temperatures may cause twinges of pain in your teeth. In later stages of erosion, this sensitive will become extreme and at times make you jump or take a sharp inhale of breath. Discoloration – When enamel erodes, more dentin (the layer of the tooth beneath the enamel) is exposed. As a result, teeth may yellow. Cracks and chips – You can generally feel cracks and chips in your teeth with your tongue. When enamel wears away, the edges of your teeth become aren’t smooth Cupping, which are indentations on the surface of the teeth, can also occur. Most of us know the basics of oral hygiene. But as a reminder, here are some things you can do to minimize tooth decay and gum disease. Eliminate highly acidic foods and drinks – Carbonated sodas and citrus fruits and juices are acidic. After ingesting any of these, rinse your mouth with clear water. Using a straw when you drink acidic drinks pushes the beverage to the back of your mouth, mostly bypassing your teeth. Sports drinks are also high in acid which will eat away tooth enamel. They can also trigger acid reflux, which drives acid back into the mouth and onto the teeth. Monitor snacks – When you snack throughout the day, you increase your risk of tooth decay, especially if those snacks of high in sugar and starches. It’s best to rinse your mouth and brush teeth after snacking or having a full meal. Chew sugar-free gum – Chewing sugar-free gum between meals boosts saliva production which helps strengthen teeth with essential minerals. Drink more water – As a general health advantage, drinking water is a good idea. But if you have low saliva volume or dry mouth, drinking more water can help increase your production of saliva, which helps your teeth. Teeth as tools – When opening boxes, packages, or breaking strings, etc., use a proper tool like scissors or box cutters. Leave your teeth for chewing. Grinding Your Teeth – If you grind your teeth, you will probably experience bone loss over time. Your dentist will normally check this during your cleaning appointments. If you grind your teeth at night, special mouthguards can be prescribed by your dentist to wear at night to prevent tooth and gum damage. Oral Piercings – Although popular, tongue and lip piercings can harbor bacteria and may also wound the inside of your mouth. Piercings near the gumline could erode the gums or even nearby tooth enamel which protect nerve exposure. Piercings can also chip your teeth. Before getting a mouth piercing, talk to your dentist about the oral healthcare risks. Mouthguards – Avoid broken, chipped and loss of teeth by protecting your teeth with a mouthguard if you are involved in contact sports. Teeth whitening – Teeth whiteners, and whitening procedures are popular these days. But if you experience gum and tooth sensitivity, discuss your options with your dentist. Flossing – If you’ve been to even one dental cleaning, you know flossing can improve your overall oral hygiene by minimizing plaque in your mouth, a sticky substance that can find every crack and crevice in your teeth. When it remains, bacteria develops causing tooth decay and other dental conditions. This is a hard habit to improve, but one of the most straightforward prevention measures available. The right toothpaste – Using a fluoride toothpaste can strengthen teeth. But using a toothpaste that is too abrasive can weaken them. The U.S. Food and Drug Administration ranks the abrasiveness of toothpastes. Anything above 100 is they have determined as harsh. A rank of 200 is highly abrasive, and any toothpaste above 200 is one to avoid. Consult a comprehensive list. Sealants – Sealants may help prevent enamel erosion and minimize tooth decay. Ask your dentist if you are a good candidate for this treatment. Even if genetics play a role in how strong, or weak your teeth are, your daily choices about oral hygiene will go a long way to keeping your mouth and teeth healthy. In addition to brushing and flossing, if you follow other prevention measures, you can be confident you’re doing the best you can to keep your teeth in great shape for life. If you’re interested in helping people care for their teeth, learn about becoming a dental hygienist, dental assistant or dental technician.